Eating right on the go is one of the difficult parts about eating clean. Almost all of the most common, most convenient foods are not going to fit in with the protocol, especially your new focus on simple, whole ingredients and food combinations. Fast food and junk food won’t cut it. For this reason, advance planning is a must. Always make sure that you have clean, whole foods on hand so that when hunger hits, you can easily turn to these snacks to get satisfaction and maintain your energy. You may even want to invest in an insulated lunch bag to store your food. 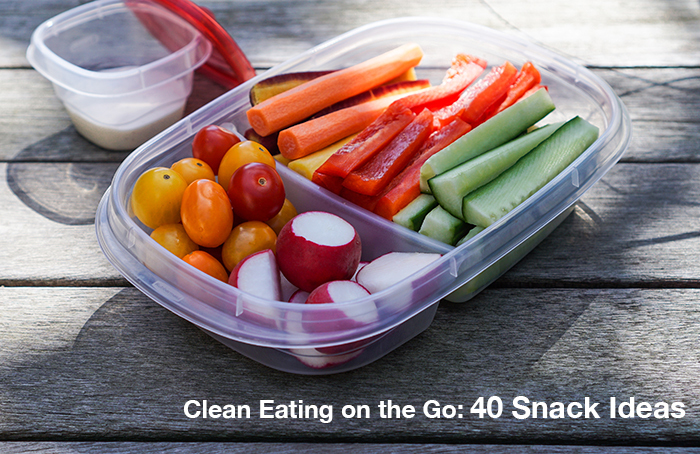 Here are 40 great suggestions for healthy, portable snacks that are clean eating friendly. Green smoothie – Freeze overnight in a wide mouth container to make it more portable. Protein powder. Pick a powder that is free of GMO, added sugar, etc. You can add water or nut milk for a quick protein drink on the go. You may also want to invest in a blender bottle. Low-sodium, grass fed beef jerky – You can also make it at home. This is just a sample of all the healthy snacks you could have. Take some time and search on Pinterest for more snack ideas. Snacking while you’re on the go is one area where extra, empty calories can easily sneak in. Make an investment in yourself and take the time to prep and pack snacks to take on the go. You are worth the extra effort.